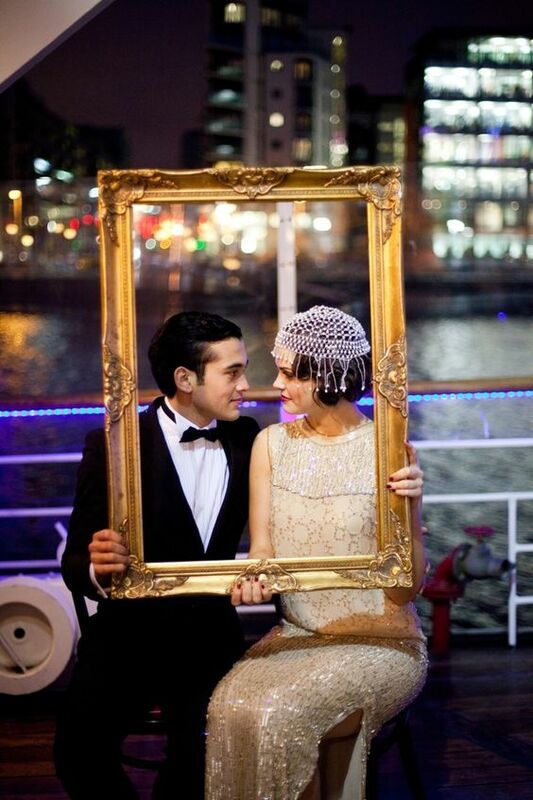 Need some inspiration for posing the next bride and groom you shoot? Choosing a great pose can take an image from good to amazing. In this article, we will share 15 unique and essential wedding photography pose ideas for couples that will “wow” your clients. As the tradition goes, don’t let the groom see the bride in her dress before the wedding! To make the shoot really fun and special, have the bride cover the groom’s eyes just before the big reveal. This is a great pose to begin the wedding shoot, so you can create a story from the subsequent shots. 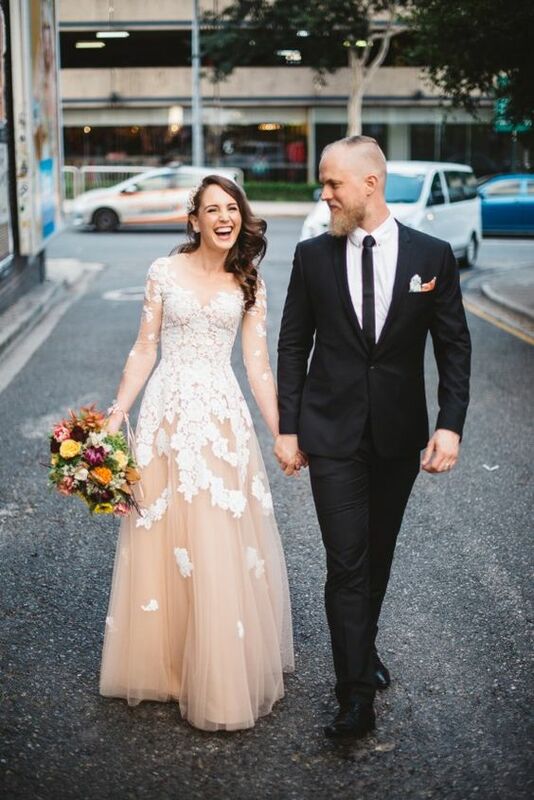 Make sure to capture the first look the groom has of the bride in her wedding gown! If the couple agrees to it, you can get this shot in private before the ceremony. 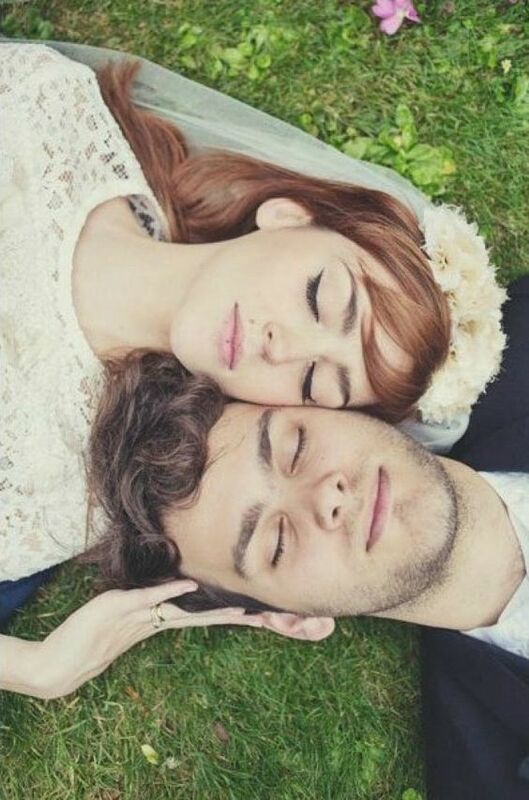 For a playful, unique shot, have the couple lie down in the grass with their heads together, facing opposite directions. 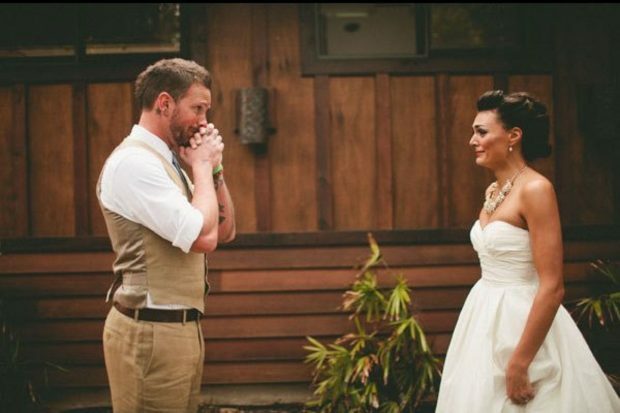 Have them close their eyes, and for a sweet touch ask the bride to place her hand on the groom’s face. A couple’s firsts are very important. 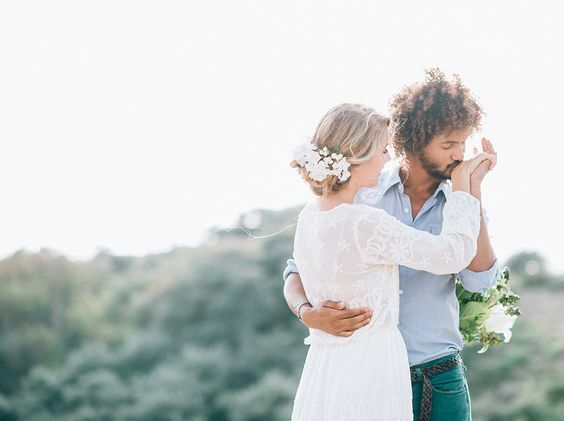 Usually the couple’s first dance happens at the reception, but you can also have your couple practice their first dance during their photo shoot. This will make a perfect memory for their photo album. For a really beautiful, unique shot, capture the moment from a balcony up above. 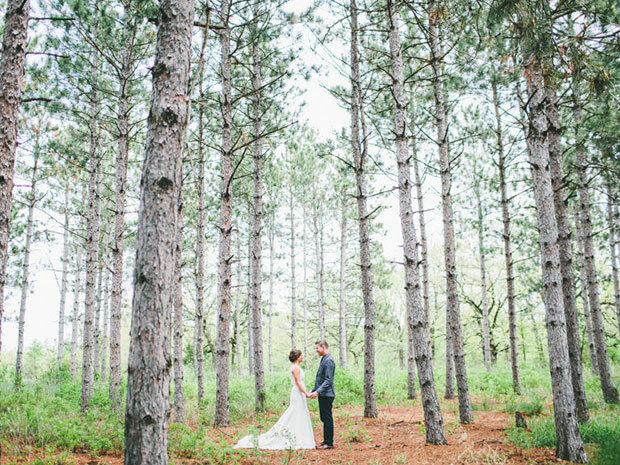 For a more dramatic shot, take the couple out into the woods or a field, and let them hold their hands while you take a wide-angle shot. Ask the couple to talk to each other, so they look natural and relaxed. This shot looks better from a distance, and make sure to use the rule of thirds. 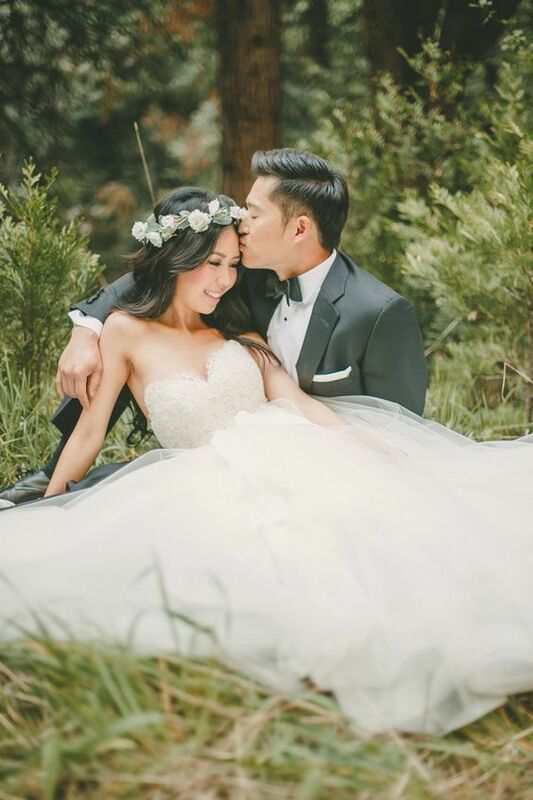 For a sweet or fairytale-like shot, ask the groom to kiss the bride’s hand. If you are having trouble getting the couple to relax, here’s a great go-to pose for you. Ask the groom to wrap his arms around the bride from behind kiss her on the forehead. This pose will give her a glow and confidence that you will notice during the rest of the session. This is a great pose for capturing a relaxed, natural gaze. Have the couple sit down casually. You could ask the groom to rest his arm on one knee or stretch his feet out in front of him, and have the bride lean in close to him. Let them chat with each other or interact with some props while you capture their loving expressions. Adding movement can really help to make your shot look more natural. Especially if you have a beach or riverside, then it’s a natural place to make the couple walk on the shore. Let them talk and take lots of shots as they move. However, even if your location isn’t ideal, take the shot anyway! It will make for a fun, unique photo. Raining on your photo shoot? Use the weather in your favor by getting a unique shot. For instance, you could tell the groom to shield the bride with his jacket. Adding a prop like an umbrella can really add charm to an image. If you are shooting at night, ask the couple to hold the umbrella towards the camera and add a light behind it. 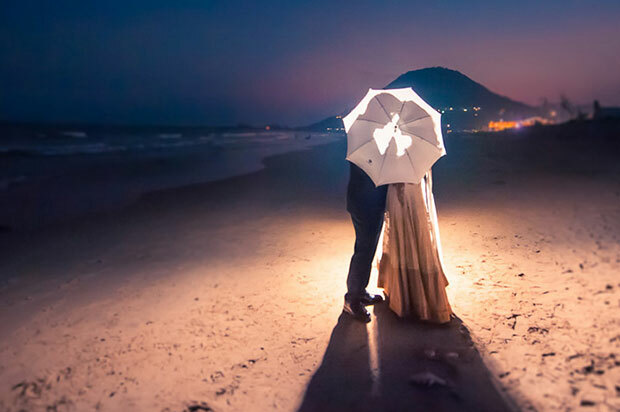 This light will create a shadow of the couple inside the umbrella and produce a beautiful, memorable shot. Another great prop is a photo frame. Have the couple hold the frame together, and capture multiple shots from different angles. You can also use windows or other structures in the vicinity as a frame for the photo. A typography prop is a quick and easy way to take a unique photo. Get creative with this, and try different poses and different angles to find a fun look. Ask the bride to relax on the shoulder of the groom. If taking a wide-angle shot, make sure her train is stretched out behind her. Or if you are taking a close up, you can soften the look of the shot with backlighting. Once the couple is feeling at ease, allow them to kiss. Get them to laugh if you want this shot to be on a lighter note. 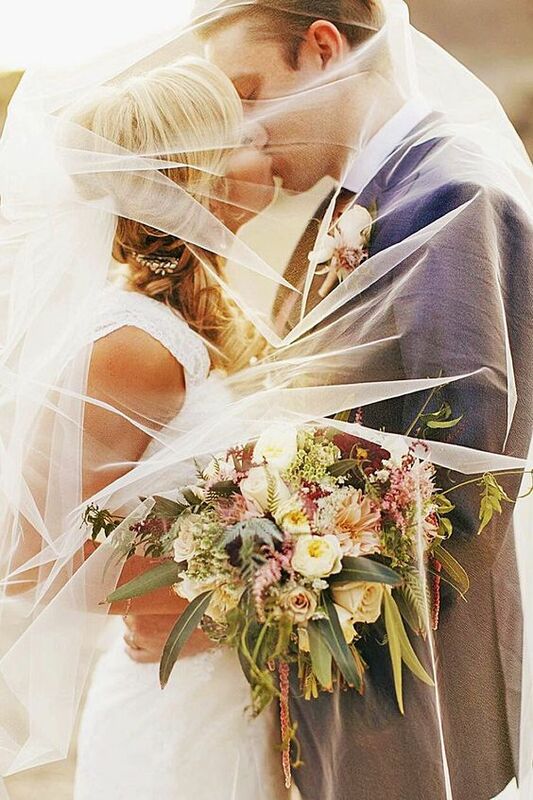 Or, to create a more intimate mood, place the bride’s veil over the couple. 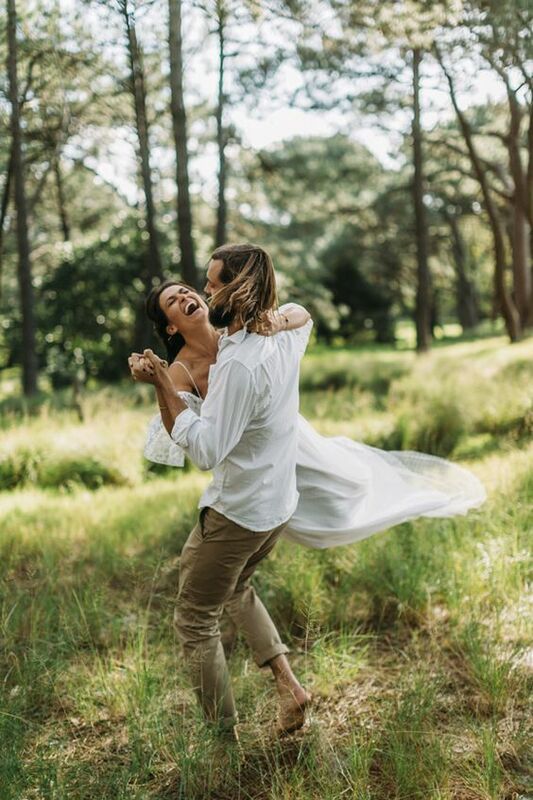 We hope this article has given you 15 unique and essential wedding photography pose ideas for couples. You may also want to check out our guide on how to take wedding photos: best wedding photography tips. If you like this article, then please follow us on Facebook and Twitter for more free photography tips. 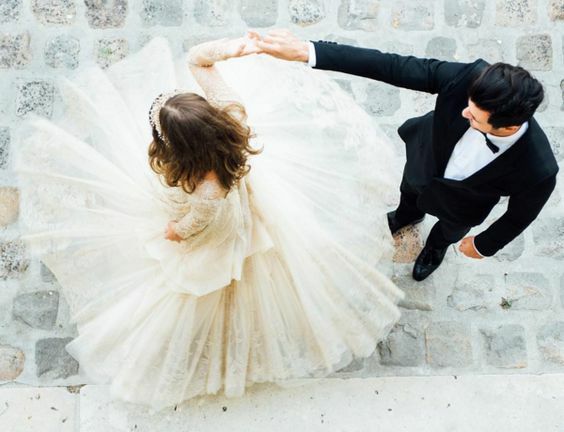 What Are the Best Aerial Wedding Photography Poses for Couples? Thanks for sharing this post.. amazing ideas and awesome pictures.. I’m also a photographer.. And i got inspiration from this post. Without photographers, you wouldn’t have these photos to boost your own blog. Please take the time to credit the photographers who are the talent behind the images you are using. The blogs using them were given permission and gave credit in return. Your site should do the same – especially if you want to earn credibility from the photography or wedding industry. Got inspired by this man! You’re so amazing. The first dance together for me is the best among the rest. It’s very memorable! I was looking for some simple poses which I can remember for our next photo shoot. Wow! Great post, I really like it, I just want to thank you for such a good ideas. Thank you for these simple yet amazing ideas…. WOW!!!!!! Excellent images..Good ideas…Thanks for sharing. I really enjoy the post…… Thanks for sharing…Awesome. Really great blog and ideas. Thanks for sharing this knowledgeable blog. I just wanted to say thanks. I enjoyed the nice & excellent ideas.